Floodwaters have affected a number of sports venues in the Waterloo/Cedar Falls area as residents continue to battle the swollen Cedar River. Officials are trying to save as much as possible in the Dan Gable Wrestling Museum. Executive director Mike Chapman says there was over one foot of water in the main display area. The area contained many oil paintings and valuable artifacts. The current facility has been opened less than two years after moving from Newton. Chapman says they raised over one million dollars to move the museum, and didn’t know it was going to be in the flood plain, and didn’t have flood insurance. Chapman says the river is like wrestling, it put them on their back. But he says they’ve already gotten up and turned around. Chapman says they’re are wrestlers, so they will go after it. Chapman was asked about a dollar amount on the damage. He says off the top of his head a minimum of $50,000 in inventory and collectibles. He says that’s probably a low ball estimate. The Waterloo Bucks won’t be playing at home in the near future. 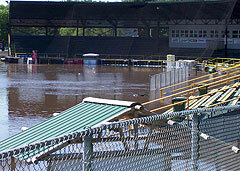 Floodwaters have inundated Riverfront Stadium and team officials says a home stand that was scheduled through next Monday has been washed out. The Bucks were scheduled to play in Waterloo on June 19th. That now depends on how quickly the water recedes.